Child theft in health facilities; Mulago national referral hospital on the spotSafe delivery, a reverie for Uganda; Child theft at the peak. Out of 57 Million deaths that occur globally every year, 63% (36 million) are due to Non Communicable Diseases (NCDs). These NCDs are commonly cardiovascular diseases, cancers, diabetes and chronic lung diseases. The Uganda National Household Survey 2009/10 revealed that Non-Communicable Diseases (NCDs) and their risk factors are now an emerging problem in Uganda although the focus has been directed to infectious diseases to a greater extent. The World Health Organization notes in its 2010 global status report on NCDs, that NCDs are rising rapidly and are projected to exceed communicable maternal, perinatal and nutritional diseases as the commonest causes of death by 2030. Risk factors leading to common NCDs such as tobacco use, unhealthy diet, insufficient physical activity and the harmful use of alcohol are highly prevalent within our societies, communities and families. For example in a recent survey carried out by the Center for Health, Human Rights and Development (CEHURD) with support from United Nations Development Program (UNDP) Uganda country office, on the prevalence of risk factors for non communicable diseases among university students in and around Kampala, it was revealed that up to 67% of the respondents did not know what NCDs were, 12% of students have used drugs, particularly Marijuana, 15% were current tobacco smokers, 9% smoked Shisha. More than 40% of the respondents were staying with parents who smoke, 10% have friends who smoke, 60% have smoked for less and 57% exposed to pro-cigarette advertisements. The World Health Organization (WHO) says that a major reduction in the burden of NCDs will come from population-wide interventions, such as tobacco control measures and cutting on raw salt intake, improved health care, early detection and timely treatment. Early detection of NCDs necessitates availability of NCD screening services in health facilities. But how many health facilities in our districts have these services? In areas where NCD services are available, these are often hampered by access to essential medicines. A recent visit to communities of Nyenga and Najja sub-counties of Buikwe district revealed that a huge percentage of the community members find no point in visiting health facilities if not sick let alone screening for NCDs. “We are not interested in NCD screening if we have no medicines in health facilities within our physical reach” Laments Mary Scovia Namwanje, a resident of Bujuta B , Nyenga subcouty- Buikwe district. With the increasing levels of poverty in Uganda, how many Ugandans can afford to buy the expensive brand NCD medicines? The situation at hand requires government to strengthen existing health facilities by providing among others essential NCD medicines and NCD screening services for at least all health center IVs as well as district, regional and national referral hospitals – prioritization of NCDs by government is the way to go. The Global Strategy on Diet, Physical Activity and Health, 2004, outlines the factors that increase the risks of non communicable diseases as being; elevated consumption of energy-dense, nutrient-poor foods that are high in fat, sugar and salt; reduced levels of physical activity at home, at school, at work and for recreation and transport; and use of tobacco. Most risk factors leading to NCDs cited are preventable without incurring expenses. This requires individual and community interventions. Growing and eating of fruits and vegetables, avoiding tobacco growing and smoking, engaging in physical activities in schools, homes and work places etc. It is noticed that majority Ugandans carryout agriculture and grow a variety of nutritious foods including fruits and vegetables but all these are sold off without sparing any for home consumption – what can government do to help? The first steps in the reduction of NCDs require individuals to take care of their health by avoiding life styles leading to NCDs – It’s everyone’s responsibility to fight NCDs. As concerned citizens of Uganda, we should not apportion blame for the increased cases of NCDs to either government or community. 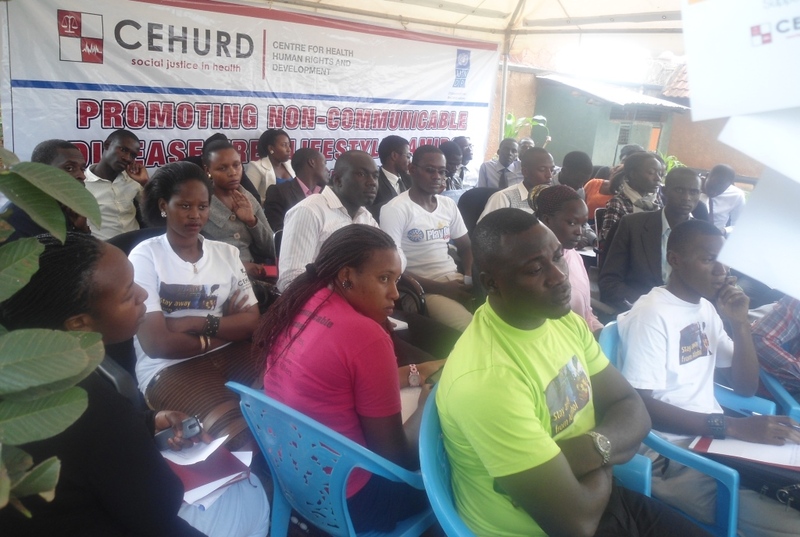 Collective efforts of government, Civil Society Organizations, communities, individuals, private sector in promoting interventions geared towards reducing NCD risk factors is the shorter route to the reduction of increased cases of NCDs in Uganda.